The Oakmont community of Lansbrook is one of Palm Harbor's finest maintenance free villa home neighborhoods and is located just off of East Lake Road. This great community features homes for sale constructed in the late 1990s that have been impeccably maintained and upgraded. They offer waterfront views of a quiet pond, boat docks at the community park, and a community pool. There's also a golf course nearby and have golf course views! Inside, these detached villa-like single family homes are stunning. They have beautiful architectural features, including volume ceilings, grand foyers, and lots of planter shelving. Many include gourmet kitchens with upgraded wood cabinetry, fireplaces, granite tiles, and beautiful hardwood flooring. These homes have 2 to 4 bedrooms and range in size from roughly 1700 to 3000 square feet of living space. All have dens or bonus rooms that can easily be a home office or study. 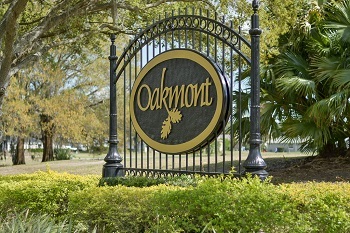 The Oakmont community is very well kept with nice landscaping and plenty of beautiful oaks and tropical plants. The community offers of feeling of quiet and relaxation. It's also an easy commute to Tampa and the Florida Gulf Beaches are just minutes away. Rarely available, let us help you get in on one of these great deals with an email alert. Request one below. Selling your Home in Oakmont? Are you thinking about selling your home in Oakmont but the thought of it makes you cringe? Look no further than Lipply Real Estate. Our highly skilled agents have created a top of the line marketing plan to fit your home selling desires. We work with you to help you make the best possible sale of your home. Call us today at 727-314-1000 or enter your information in the form below.